Pit, also known as Kid Icarus on occasion, is a young angel who is the main protagonist of the Kid Icarus series, and the captain of Palutena's army. His most notable appearance alongside Mario franchise characters, however, is in the Super Smash Bros. series. 1.1 "Super Mario: Die Bescherung"
Pit along with other Nintendo characters (and Mega Man) in Super Mario: Die Bescherung. Pit makes a minor appearance in the Club Nintendo comic Super Mario: Die Bescherung. In this comic strip, Pit is one of the invited guests that Mario had invited over for a Christmas party that he is hosting. Within the comic, Pit is seen alongside various characters including Mario, Luigi, Princess Toadstool, Toad, Yoshi, Link, and Mega Man. His appearance resembles his artwork from Of Myths and Monsters. Mega Man (left) next to Kid Icarus (right) in Captain N: The Game Master. 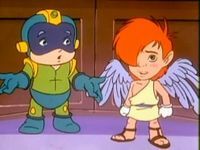 Pit, referred to as Kid Icarus, appeared as a recurring character in the American television series, Captain N: The Game Master. Pit descends onto the stage from a bright light. Pit makes an appearance as an unlockable trophy in Super Smash Bros. Melee. Pit appears as a new fighter in Super Smash Bros. Brawl. 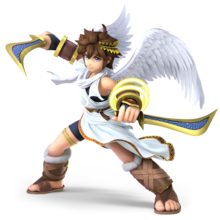 Pit's design has been significantly altered from his design in the two Kid Icarus games before, based on Masahiro Sakurai's interpretation of what Pit would look like if the Kid Icarus series had continued after Of Myths and Monsters. Pit is voiced by Minami Takayama in the Japanese version, and Lani Minella in the English version. Pit carries the Sacred Bow of Palutena, which can fire arrows or split into two blades for up close combat. Because of his wings he is able to jump multiple times, and can also glide. 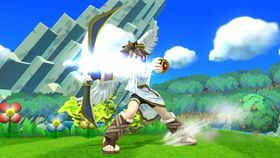 Pit's standard special move in this game is Palutena's Arrow, which lets him shoot an arrow that can be directed as it flies. His side special move is called Angel Ring, which is an attack that spins his bow and deflects projectiles. 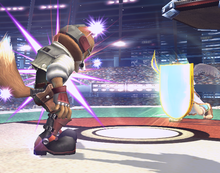 Pit's down special move is the Mirror Shield, which allows him to reflect any attacks from the front. Finally, his up special move is the Wings of Icarus, which allows him to briefly fly. Pit's Final Smash, Palutena's Army, summons Centurions to attack opponents. In the Subspace Emissary of Super Smash Bros. Brawl, Pit joins the story early in the game. He was watching the fight between Mario and Kirby at Midair Stadium when he sees the devastation of the Subspace Army's Subspace Bomb, and is sent by Palutena to go assist the other heroes in defeating the Subspace Army. Palutena gives him the Palutena's Bow. He hurries down to the world, so he can help the other defeat the Subspace Army. He lands on a spot near the Halberd, and has to fight Primids and other Subspace enemies that are appearing. He also finds Mario, transformed into a trophy. He awakens him and the two team up. They soon witness Fox McCloud's Arwing chasing after Halberd. Upon reaching solid ground, they find the Ancient Minister carrying another Subspace Bomb, but they were unable to reach him, and he gets away. What happens next depends on which princess was rescued. If Princess Zelda was rescued, Pit destroys the Dark Cannon that False Zelda is about to fire at Link and Yoshi, and subsequently fights her with Mario. They are then attacked by Link and Yoshi, who have mistaken False Zelda as the real Zelda. Otherwise, if Princess Peach was rescued instead, then Pit and Mario are instead targeted by False Peach, who was defeated by Link and Yoshi. Pit and Mario then end up fighting them as well. In both variants, the outcome is similar; the team who defeated the fake princess also defeat the other team, who gets snatched up by King Dedede's Cargo. However, Kirby arrives and revives the defeated team from their trophy forms. Then either Pit or Link blows out the Cargo's engine and all five go after Dedede. Pit and the others track Dedede down to his castle, but upon entering, they find the throne room in ruins. They explore a nearby cave and eventually find Bowser getting away with the princess that wasn't rescued in the beginning. Pit fires an arrow Bowser, but this only causes a badge that the princess was wearing to fall off. Bowser escapes to the Halberd. Pit and the others eventually find the Ancient Minister again, this time in the Wilds. After chasing him for a period of time, the R.O.B.s intervene and detonate the Subspace Bomb that the Minister had been carrying. Pit and the others escape from the blast and reach the Canyon, where they fought hordes from the Subspace Army and meet other heroes. They were eventually joined by even more fighters before entering Subspace, where they met defeat by Tabuu. Fortunately, King Dedede had designed badges (including the one Kirby ate) to revive fighters from their trophy forms after a set amount of time. With Luigi and Ness by his side, Dedede rescues Pit and most of the others, while Kirby saves the remainder of the team. They then explore the Great Maze before reaching Tabuu for their final battle. Pit returns as a playable character in Super Smash Bros. for Nintendo 3DS and Super Smash Bros. for Wii U, though he is now voiced by Anthony Del Rio, his voice actor from Kid Icarus: Uprising. While part of his moveset is the same as in Super Smash Bros. Brawl, such as Palutena's Arrow (now named Palutena Bow, as the weapon is known in Kid Icarus: Uprising), all of his other special moves as well as his Final Smash have been replaced, mostly to reflect his appearance in Kid Icarus: Uprising. While Pit still has multiple jumps, the gliding mechanic has been removed entirely. His side special has been changed to the Upperdash Arm, in which Pit dashes forward to uppercut opponents, and his down special is the Guardian Orbitars, which puts up a pair of shields to defend Pit on both sides. His up special is the Power of Flight, which gives Pit a brief burst of height. His Final Smash has been changed to the Three Sacred Treasures, in which he dons the treasures and attacks with light arrows. In addition, by quickly using Pit's down taunt on the Palutena's Temple stage in Super Smash Bros. for Wii U, it triggers his smash taunt, Palutena's Guidance, in which Pit, Palutena, and Viridi appear and talk about one of the opponents, similar to Snake's codecs in the previous game. Pit returns in Super Smash Bros. Ultimate, as an unlockable playable character, retaining his special moveset from the previous installment. He has a new Final Smash, where instead of wielding the Three Sacred Treasures, he rides in on the Lightning Chariot. Dark Pit is also specified as an Echo Fighter based on Pit in this game. Pit gains a new quote for his Star KO'd animation. Pit's up tilt is called Anti-Air Attack, while his down aerial is called Under-Arch Slash. Pit has received many improvements compared to the previous installment, such as faster mobility, reduced short hop timing and landing lag in aerial attacks, the reintroduction of directional air dodging, the ability to dash cancel any ground attack, and the ability to use aerial attacks on ladders. Pit also receives improvements such as decreased ending lag in his up tilt, down tilt, and down throw; increased ability to knock back opponents in his dash attack, forward smash, back aerial attack, and down aerial attack; and increased damage for his standard, forward, and up aerial attacks. The Palutena Bow (known as Palutena's Arrow in Super Smash Bros. Brawl; also referred to as the Sacred Bow of Palutena and Palutena's Bow) is Pit's standard special move. Pit fires an arrow from the bow that can be controlled with the analog stick. The move can also be charged by holding down the special move button before firing, and can be aimed in either direction or directly up as it charges. In Super Smash Bros. for Nintendo 3DS / Wii U, this move has two custom variants. The first is Piercing Bow (named Bow of Piercing in the PAL version), which is more powerful but takes longer to charge, travels more slowly, and cannot be guided. The second is Guiding Bow (named Bow of Guidance in the PAL version), which gives greater control over the arrow but makes it less powerful. Dark Pit's version of this move is Silver Bow. Angel Ring is Pit's side special move in Super Smash Bros. Brawl. When used, Pit rapidly spins his bow to deal multiple hits to enemies, and can continue to attack by repeatedly pressing the special attack button. The move can also deflect projectile attacks. The Upperdash Arm is an Arm weapon from Kid Icarus: Uprising that appears as Pit's side special attack in Super Smash Bros. for Nintendo 3DS / Wii U and Super Smash Bros. Ultimate, replacing Angel Ring from Super Smash Bros. Brawl. When used, Pit dashes forward and uppercuts any opponents in his path. The move can also deflect projectiles when executing the uppercut. In Super Smash Bros. for Nintendo 3DS / Wii U, this move has two variants: Interception Arm and Quickdash Arm. Interception Arm turns the move into a counter move, allowing Pit to counterattack opponents with an uppercut when attacked. Quickdash Arm has a longer and faster dash which continues after dealing the attack. Dark Pit's version of this move uses the Electroshock Arm. Wings of Icarus is Pit's up special move in Super Smash Bros. Brawl. It is most likely a reference to both the Wings of Pegasus, one of the Three Sacred Treasures from the original Kid Icarus, and the Angel's Feather, an item from the same game that gives Pit temporary flight. When used, Pit's wings turn blue, and the player is able to fly freely for a limited time. The move gives Pit extra height when used from on the ground, also pushing away nearby opponents and items. The Power of Flight is the up special move used by both Pit and Dark Pit in Super Smash Bros. for Nintendo 3DS / Wii U and Super Smash Bros. 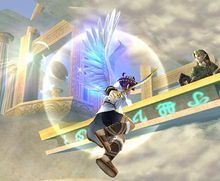 Ultimate, replacing Pit's previous up special move from Super Smash Bros. Brawl, Wings of Icarus. It is based upon the limited flight power granted to Pit by Palutena in Kid Icarus: Uprising for the game's flight combat sections, as Pit cannot fly on his own. When used, Pit briefly charges up and takes off in the direction the player holds the stick in a quick burst of movement. Pit and Dark Pit also share custom variations of this move in Super Smash Bros. for Nintendo 3DS / Wii U. The first is Striking Flight, which deals damage as Pit takes off, but can only be used to move at a slight left or right angle. The second variation is Breezy Flight, which does not send Pit as high, but is faster to execute and creates a whirlwind when taking off that pushes away opponents. 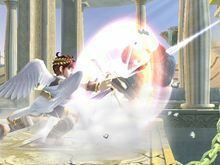 The Mirror Shield is one of the Three Sacred Treasures in the Kid Icarus series that appears in Super Smash Bros. Brawl as Pit's down special move. When used, Pit crouches and holds a shield up in front of himself that reflects oncoming projectiles, also causing them to deal more damage. It can also protect against physical attacks, though only when the attacker is facing Pit. The player can keep the shield out longer by holding down the special button, and can also angle the shield upward with the control stick. 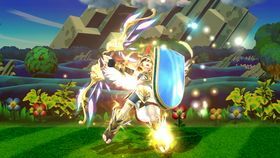 Although it is replaced by the Guardian Orbitars in Super Smash Bros. for Nintendo 3DS / Wii U, the Mirror Shield still appears in Pit's Final Smash, Three Sacred Treasures, though it is only aesthetic. The Guardian Orbitars are weapons in the Orbitar weapon class in Kid Icarus: Uprising, appearing as the down special move for both Pit and Dark Pit in Super Smash Bros. for Nintendo 3DS / Wii U and Super Smash Bros. Ultimate, and replacing Pit's Mirror Shield move from Super Smash Bros. Brawl. Pit summons the Guardian Orbitars to project a pair of shields around both sides of himself that can block attacks from both sides. They also push away opponents upon use, and remain active for a limited time as long as the player holds down the special move button, or automatically after a few seconds. If the shields are attacked enough, however, they shatter, preventing the player from using them for a time. Pit and Dark Pit also share this move's custom variations in Super Smash Bros. for Nintendo 3DS / Wii U. The first is Impact Orbitars, which makes the move a proper attack at the cost of defending Pit. The second is Amplifying Orbitars, which increases the power of reflected projectile attacks but makes the Orbitars weaker. —Masahiro Sakurai, Smash Bros. DOJO!! Palutena's Army is Pit's Final Smash in Super Smash Bros. Brawl. When it is used, the goddess Palutena appears in the background and Pit calls several Centurions to the battlefield to attack opponents by ramming into them. Each Centurion disappears after hitting an opponent, and can also be defeated by attacking them. The Three Sacred Treasures are powerful, legendary artifacts owned by Palutena in the Kid Icarus series, consisting of the Arrow of Light, Mirror Shield, and Wings of Pegasus. The treasures make an appearance as Pit's Final Smash in Super Smash Bros. for Nintendo 3DS / Wii U, replacing Palutena's Army from Super Smash Bros. Brawl. When used, Pit dons the treasures and starts firing off light arrows in the direction he's facing. Pit fires several small arrows, homing bursts of light, and a large light arrow that is fired in an arc toward an opponent. After launching all of the arrows, Pit calls down several beams of light that are spread across the stage, damaging opponents and breakable obstacles they connect with. Afterwards, Pit unequips the Three Sacred Treasures. Despite having all three treasures equipped, Pit only uses the Arrow of Light for this attack. 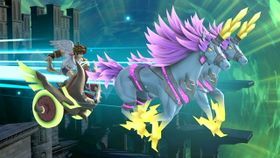 The Lightning Chariot is a sacred vehicle from Kid Icarus: Uprising drawn by two unicorns, Phos and Lux, and formerly owned by the Chariot Master. It appears as Pit's Final Smash in Super Smash Bros. Ultimate, replacing the Three Sacred Treasures in Super Smash Bros. for Nintendo 3DS / Wii U, and functions similar to the Dragoon. Upon activating the Final Smash, Pit rides the Lightning Chariot into the background and crosshairs appear on the screen, allowing the player to aim their attack. After doing so, Pit charges onto the stage, damaging and launching any opponents within range. Pit in the Kid Icarus microgame in WarioWare: Twisted! Pit appears as part of the Kid Icarus microgame in WarioWare: Twisted!, based upon the NES game. The objective is to tilt the Game Boy Advance so that Pit can avoid the attacks from the Eggplant Wizards. In WarioWare: Smooth Moves, Pit makes an appearance as one of the 8-bit characters performing in the Opening Night microgame, during stages two and three. Pit appears in the Kid Icarus microgame in international versions of WarioWare: D.I.Y. Showcase, in which players must break the pots and collect the items in a room in order to win. By tapping the Pit amiibo to the Wii U GamePad in Super Mario Maker, the player will unlock a Mystery Mushroom that gives Mario a costume based on Pit to use in the Super Mario Bros. graphical style. Rather than use his original Kid Icarus sprite, the sprite for this game is a new one based on his design in Kid Icarus: Uprising. When in use, the costume also replaces some sound effects with sound effects from the Famicom Disk System version of Kid Icarus. 07/87 The head of Palutena's personal bodyguards, Pit traveled near and far to gather Three Sacred Treasures that would help him defeat the evil goddess of darkness, Medusa, and free Palutena, the goddess of light. Pit couldn't fly with his little wings; only the Wings of Pegasus let him take flight. Will Pit ever fight again? Instruction Booklet: "The hero from Kid Icarus fights with Palutena's bow, which converts into dual blades." Website: "The protagonist in Kid Icarus. Pit's Sacred Bow of Palutena is actually two blades combined. He can separate them or unite them at will for use in battle. The arrows Pit's bow unleashes shoot out like beams of light. Players can control the curves of their trajectories." NES Kid Icarus The captain of the royal bodyguards of Palutena, goddess of light and ruler of Angel Land. The dark goddess, Medusa, conquered the underworld, the surface world, and the heavens, and imprisoned Palutena. Pit escaped and, armed with Palutena's magical bow, set out to free her. Along the way, he gathered Three Sacred Treasures with which he challenged Medusa. Wii Super Smash Bros. Brawl Pit's Final Smash. 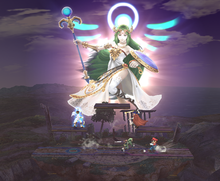 An image of the goddess Palutena appears, heralding the arrival of Pit's legions, the Centurions. These flying warriors proceed to attack all enemies with fierce savagery. Once a Centurion strikes an enemy, he falls from the sky, never to fly again. Centurions are so fast that dodging them is very hard. Take heart, Centurions! Your deaths are not in vain! Snake: Otacon, there's a kid with wings out here. Is he a mutant? Or is he just into costumes? Otacon: That's Pit, Snake. Pit is an angel from Angel Land. He's the captain of Palutena's Army. Snake: Angels. Give me a break! Otacon: I dunno, maybe he's from a different species. But those wings on his back and those mysterious weapons he has are the real deal. He may look young, but he's a veteran warrior. Watch yourself. He used to be a weakling, but countless trials over the years have toughened him up. Snake: And by trials, you mean, "Game Overs"? Otacon: Yeah, you should know all about that. 3DS Kid Icarus: Uprising (03/2012) Pit is the captain of Palutena's royal guard. 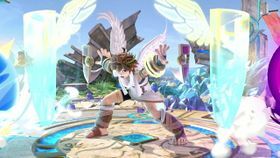 Despite the wings on his back, Pit needs the Power of Flight from Palutena in order to truly fly. In Smash Bros., he can still get more air than most, with four jumps and a special move that boosts him higher. He has a new reflect move—it protects both sides! 3DS Kid Icarus: Uprising (03/2012) Pit's side special Upperdash Arm delivers an uppercut so strong, it can send foes flying for a KO. If you miss and fall off the stage, Pit's up special can bring him soaring back. Another of Pit's specials is Palutena Bow, which fires arrows Pit can aim even after they've left the bow. N/A Let's squash a misconception right now–there is nothing worse then being turned into an eggplant. Just lettuce tell you, being hit by an eggplant bomb is humiliating. It leafs you without mushroom to maneuver and also makes you the laughing stalk of your friends. N/A The Arrow of Light, the Wings of Pegasus, and the Mirror-three legendary artifacts that Pit once used to defeat the evil Medusa. When you activate Pit's Final Smash, he can use them in this game too! After firing a barrage of different bow attacks, his final shot will cause powerful light pillars to rain down on the battlefield. Red indicates exclusive to the Nintendo 3DS version. Blue indicates exclusive to the Wii U version. Pit: Wait a sec! Is that...me? Palutena: It certainly appears to be the case. Pit: You're awfully calm about this, Lady Palutena! Palutena: Well, we've been through a similar situation in the past. Don't you recall? Pit: Yeah, but it's still freaky. It's like looking through a twisted mirror! That reminds me. You know how Dark Pit came from a mirror? Then why doesn't he move left when I move right, and vice versa? Pit: But you're supposed to know everything! Don't you have an all-seeing eye and an all-knowing brain and all that? Palutena: My all-seeing eye sees you getting hit. Palutena: I'm sure the true Pit would triumph over any doppelgänger. So I guess now we'll see if you're the real deal! Pit: I meant to ask you about one more thing. Have you noticed that I can kind of fly on my own a bit? Palutena: Actually, it's called jumping, Pit. Sorry to be the one to break it to you. Pit is the captain of Palutena's royal guard and hero of the Kid Icarus games. Despite the wings on his back, Pit needs the Power of Flight from Palutena in order to truly fly. With the aid of Palutena, goddess of light, Pit fends off the resurrection of Medusa and her Underworld Army to save the land from the dark goddess. 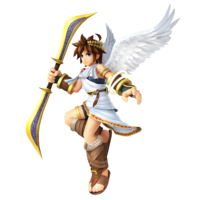 Pit's redesign from Super Smash Bros. Brawl was re-used in Kid Icarus: Uprising for the Nintendo 3DS developed by Sora Ltd., who also developed Super Smash Bros. Brawl. Pit is the only fighter in Super Smash Bros. Brawl that does not appear in his own Final Smash trophy. ↑ "In bringing [Pit] to Super Smash Bros. Brawl, I [Masahiro Sakurai] designed him imagining, 'if the series had continued and he had evolved with it over these long years, what kind of character would he be?'" 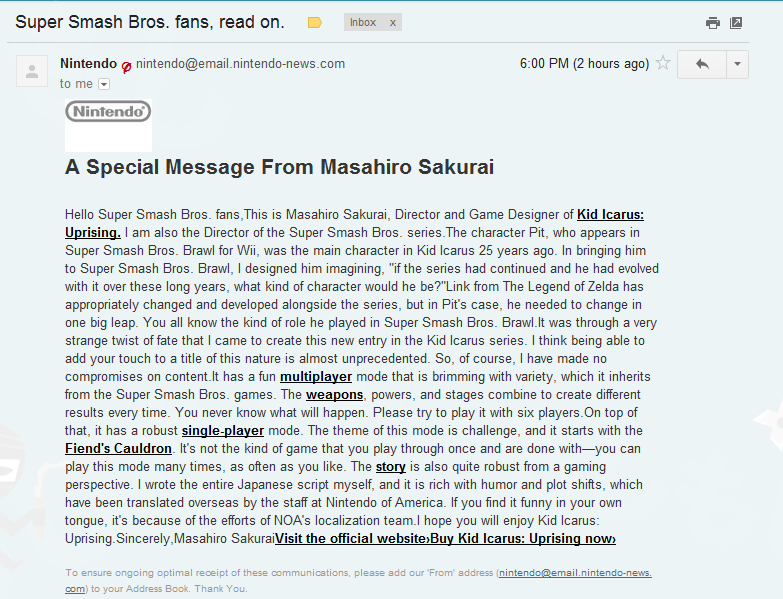 Promotional e-mail from Nintendo for Kid Icarus: Uprising. SmashWiki. Retrieved September 6, 2015. ↑ Pit on the Smash Bros. DOJO!! website. This page was last edited on March 16, 2019, at 13:53.